Classes in music and visual art foster a challenging, creative, exciting educational environment of diversity and open inquiry that values both faith and reason. The arts promote moral and spiritual development and educate the whole child, including intellectual, personal, social, physical and aesthetic development. Every student at St. Andrew’s has music and art classes weekly. In music classes, aesthetic appreciation of the compositions and musical instruments of all cultures is emphasized. An active, hands-on approach encourages students to experience music with personal meaning. Students play hand bells, chimes, and other instruments as well as participate in performances in which they can apply their musical knowledge. In visual art classes, students are taught to appreciate creative expression and experimentation. Art is the practice of empowered decision-making: to see problems or mysteries from many angles, and to approach these questions with confidence and curiosity. Students at St. Andrew’s experiment with this empowered decision-making in many mediums: painting, drawing, animation, bookmaking, puppetry, and sculpture. The exploratory elements of the arts curriculum are bolstered in a global perspective of art history and the formal elements of art and design. Additionally, students in Grades 2–8 perform a major and a minor play each year. Students work with their classroom, art, and music teachers to develop scripts, produce musical selections, and to design and paint a set. Pre-Kindergarten through First Grades also present performances several times during the year. 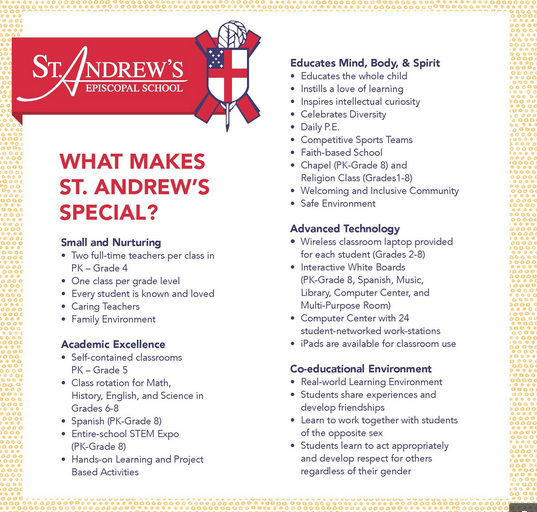 Performances are a beloved tradition of St. Andrew’s that embody the School’s commitment to educating the whole child.